Description: Action: Bolt - Caliber: 6.5 Creedmoor - Finish: Blued - Stock: American Walnut - Twist: 1:8 - Barrel Length: 22 #3 - Weight: 7.1 lb - Our B-14 Series brings Bergara Barrel accuracy to a line of hunting rifles that is affordable to almost any serious big-game hunter. Built in Spain at our highly-automated barrel factory highly-efficient production techniques allow us to deliver a rifle with a level of quality and performance that is unmatched for the price. The world-famous Bergara barrel is complemented by our own super-smooth B-14 Action with a coned bolt nose and breech ensuring consistently smooth feeding and a sliding plate extractor for proper alignment. The Bergara 4140CrMo steel barrel is finished in matte blue and is available in 22-inches (Short Action) and 24-inches (Long Action). Our stocks are bedded with integral pillars for stability and enhanced accuracy. B-14 rifles are guaranteed to produce 100 yard groups of 1.0 MOA or better with quality factory ammunition. 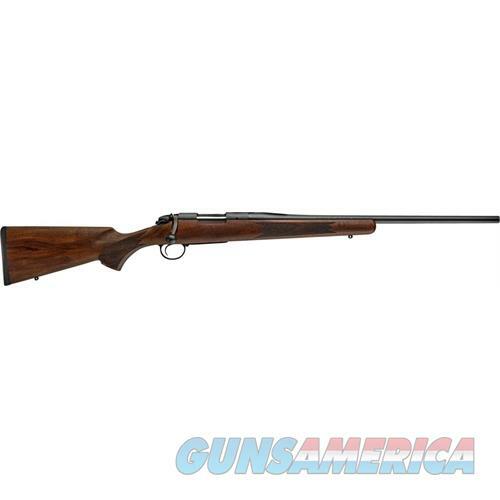 The Woodsman rifle features a walnut stock of the same quality and made by the same process as the Timber but in a sleek American Classic shape with a straight comb and no cheek piece. Wood Stock process: During the stock making process 2 oversized holes are machined and filled with a tough metal infused epoxy resin. After the epoxy cures the stock is CNC machined to exacting tolerances. The result is 2 solid epoxy pillars that surround the action screws. The high grade European walnut stock is then finished with multiple coats of hand rubbed oil.